I’ve never met anyone who got sick from clean habits, but I have known a lot of people who have suffered the consequences of not practicing cleanliness. Two of the easiest and most important things you can do to stay healthy is handwashing, and, keeping your hands from away from (touching) your face. Wash your hands frequently and dry them thoroughly. Keep your hands away from your eyes, nose, and mouth because that is the easiest way to transfer germs and viruses into your system, and get sick. Here is some handwashing information I found on the internet from various websites. It is very useful. I suggest you make a lifetime commitment to proper handwashing. Keeping your hands clean is one of the most important steps to avoid getting sick and spreading germs. Many diseases and conditions are spread by not washing hands with soap and clean, running water. If clean, running water is not accessible, use soap and available water. If soap and water are unavailable, use an alcohol-based hand sanitizer that contains at least 60% alcohol to clean hands. Note: Alcohol-based hand sanitizers can quickly reduce the number of germs on hands in some situations, but sanitizers do not eliminate all types of germs and might not remove harmful chemicals. Hand sanitizers are not as effective (as soap and water) when hands are visibly dirty or greasy. Rinsing your hands before you wash them may get rid of topical germs. After adding soap, lather up the soap by rubbing your hands together. Be sure to get the webs (between your fingers, including the web between your pointer finger and thumb). Continue rubbing for 15 -20 seconds. It is recommended that you wash your hands with a song. Singing your ABC’s, or Row, Row, Row Your Boat, or the Happy Birthday song, two or three times, ensures that you are spending adequate time washing your hands. Every year during the month of November (Monday, November 12th at midnight — Friday, November 16th at 4:00 pm), Mountaintop Faith Ministries (MFM) embarks upon a week of ‘O Give Thanks, a week of consecration; reflecting on God’s goodness, His mercy and His grace towards us. It is during this time that we empty out or vacate our “house” and allow Jesus to take over and occupy our life in every aspect (mental, physical, financial, social and most of all spiritual). We exchange what we need to survive for what we need to live and that is Christ. Fasting is a faith-move. We believe that because we are empty and ready to receive from God that the Holy Spirit will speak to us more clearly, filling us with His wisdom, knowledge and understanding. From a physical aspect, fasting helps to detox our bodies, especially, if we replace food with fresh water. Fasting helps reduce clogged arteries and lowers heart disease. So as we go through the week of ‘O Give Thanks, let us fast, pray, mediate and praise God for this is truly the embodiment of health and wellness. Someone once said, “Fasting without prayer is just dieting.” When you are doing a spiritual fast, it automatically comes by “prayer and fasting.” (Matthew 17:21). And so in health and wellness we do not “diet;” but rather, we ‘cleanse’ and focus on the entire body, mind and soul. Prayer – taking time out to communicate with our Lord and Savior Jesus Christ through word or thought. Fasting- a willing abstinence or reduction from some or all food, drink, or both, for a period of time. Healthy Eating – eating a variety of foods that give you nutrients such as: protein, carbohydrates, fat, water, vitamins, and minerals you need to maintain your health, feel good, and have energy. Wellness – the state of being in good health, especially as an actively pursued goal. Note: Please consult your doctor / health professional before beginning any fast. On October 23rd, Mountaintop Faith Ministries First Aid Ministry in conjunction with CHR, Inc., (Caring, Helping and Restoring Lives) hosted their annual Pink & Purple Sunday. The church arrayed itself in pink and/or purple to bring awareness to breast cancer and domestic violence. First Lady Dr. Mary L. House, who is also the CEO/President of CHR, Inc. has a passion for domestic violence awareness. 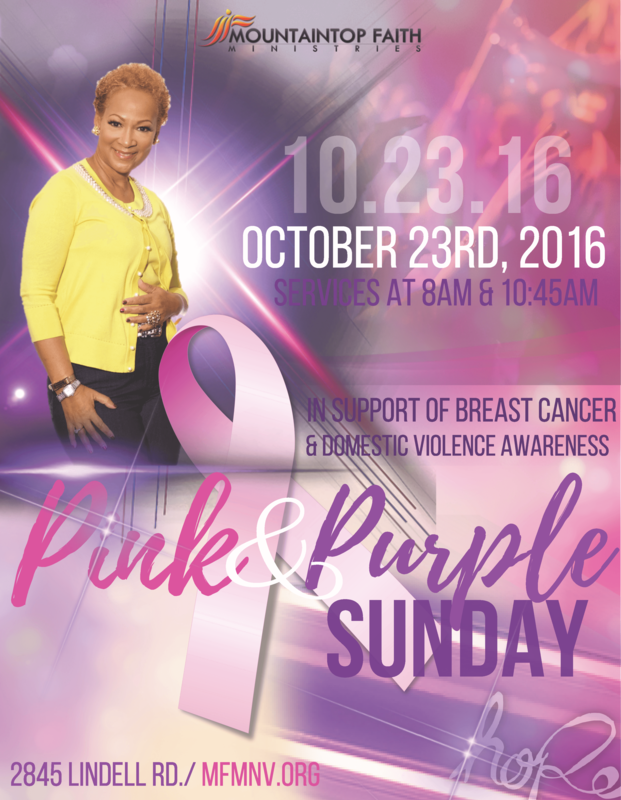 She has shared her testimony of being a witness to domestic violence in her parents home; thus, bringing together the Pink & Purple Sunday to the church. During both the 8:00 am and 10:45 am services, she shared the startling statistics of both issues. Breast Cancer is the most common cancer diagnosed in women in the United States, other than skin cancer. It is the second leading cause of cancer death in women, after lung cancer. There are over 3.1 million breast cancer survivors in the United States. Nevada Statistics show that breast cancer is the most commonly diagnosed cancer among women in Nevada and is the 2nd leading cancer killer among women in the State. It is estimated that 2,000 women in Nevada will be diagnosed with breast cancer in 2016 and 380 women in Nevada will die of the disease. What can you do? Get screened and talk to your doctor about which screening test are right for you if you are at a higher risk. Have a mammogram every year starting at age 40 if you are at average risk. Have a clinical breast exam at least every 3 years starting at age 20, and every year starting at age 40. You can sign up for your screening reminder at www.komen.org/reminder. Domestic violence is a pattern of violent and coercive behavior used by one partner in a relationship to control another. Every 9 seconds in the USA a woman is assaulted or beaten. Studies suggest that up to 10 million children witness some form of domestic violence annually. An estimated 29% of African American females are victimized by intimate partner violence in their lifetime. Women in Nevada are 65% more likely to be shot and killed by intimate partners than women nationwide. Nevada has the 5th highest rate of domestic violence gun murder of any state in the country. Statistics show that Black women typically comprise about 70% of black congregations. Religious convictions and a fear of shame or rejection from the church may contribute to their remaining in abusive relationships. Dr. House also thanked her husband, Pastor Clinton House, for allowing her the platform to bring both issues to the forefront of the church. It is their desire that the Pink & Purple Sunday will be echoed throughout churches across the country. If you would like to become a volunteer, attend the domestic violence workshops or make a contribution, go to www.chrinc.net.